Every young child loves to look up at the moon in the night sky. Now here’s a Hello, World! 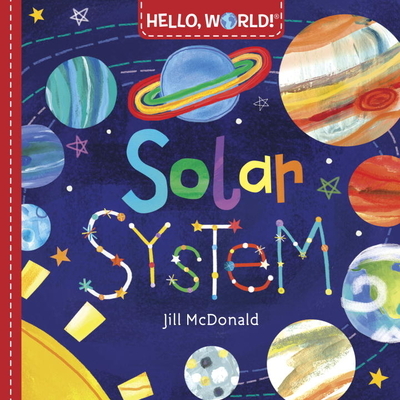 board book that can teach toddlers all about the sun, moon, stars, and planets—with colors, shapes, sizes, and super-simple facts. Look for all the books in the Hello, World! series: Weather, Backyard Bugs, Birds, Dinosaurs, and My Body. JILL McDONALD is a Missouri-based illustrator and designer whose cheery and colorful art can be found on clothing, fabric, bedding, stationery, puzzles, games, and in a variety of books for babies and toddlers. Learn more about Jill’s work at jillmcdonalddesign.com.